The machine can be modified for higher number of packages. The outputs stated above are based on polypropylene twine of medium lay, pre-twist factor F = 0.8, and an efficiency rate of 100%. 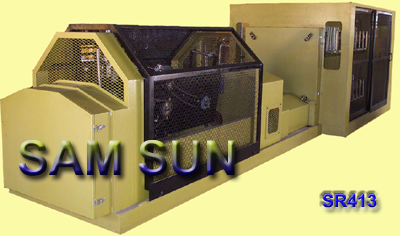 The machine can be modified to accommodate other package dimensions. Diameter 420 mm 16 1/2"
Barrel 135 mm 5 1/4"
The outputs stated above are based on polypropylene rope of medium lay, pre-twist factor F = 0.8, and an efficiency rate of 100%. 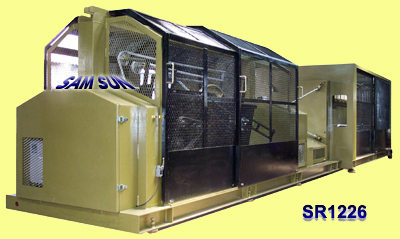 The machine can be modified to accommodate other dimensions and more packages. The rope is coiled on to a specially designed adjustable coiling head, cutting down the doffing time to less than 2minutes, and delivering a finished ready-to-sell coil. 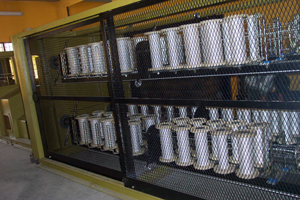 Additionally the machine can be adapted to accommodate customer's own reels providing these do not exceed the measurements of the coiling head stated below. The diameter controlled disc clutch ensures constant rope take-up tension. Crane with lifting fork and electric shackle. Diameter 910 mm 36" 900 mm 35"
Traverse 610 mm 24" max. 500 mm 20"
Barrel 300 mm 12" 260 mm 10"
* Crane with lifting fork and electric shackle. * Adjustable coiling head to produce ready-to-sell coils. 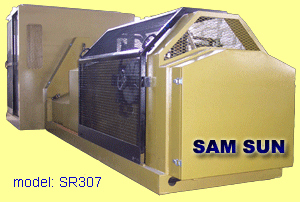 Subsidiary Companies � Samil Machinery Corp.� Hangnam Marine Corp.
Copyright� SAM SUN TRADING 1998-2015. All rights reserved. Last updated January 6, 2015.